If you’ve never owned a cat before, taking home your new furry friend could be both exciting and potentially intimidating. To do it well, being a cat owner will mean giving your cat a lot of love, care, and attention. With our knowledge and experience as animal caregivers and also as cat owners, the staff at Anasazi Animal Clinic (serving Gilbert, Chandler, and Mesa) would love to share some tips on general cat care for new cat owners. The first step to feeding a cat is to choose a well-balanced cat food with all of the essential nutrients your cat will need to grow and stay healthy over its lifespan. To ensure that a cat food is balanced, look for a statement on the packaging by the Association of American Feed Control Officials (AAFCO). Next, your cat will want to eat at dawn and dusk. Be careful about leaving food in your cat’s bowl throughout the day, since they aren’t the best judges when it comes to hunger. Last, it’s ok to feed your cat treats, but treats should not exceed 5-10% of your feline’s daily food intake. It’s always a good idea to speak with your local vet when deciding how much to feed your cat and what specific food to buy for each stage of their life. Cats are experts at grooming themselves and will rarely need a bath. But one thing you can do to help your feline’s cleanliness is to brush them. Regularly brushing your cat will cut down on the number of hairball incidents your cat experiences. Cats are often solitary creatures, preferring to have their own space and the freedom to interact with their humans whenever they choose. Choose a cool, dry place for your cat’s bed and line it with a soft towel or blanket. If you’re debating whether to make your cat an indoor or outdoor cat, we highly recommend you keep them indoors. Exposure to the elements, potential traumatic experiences, and vulnerability to ticks and fleas makes the outdoors a less desirable environment for your cat. Having proper identification on your pet is essential for both an outdoor cat and an indoor cat, since indoor kitties are famous for trying to escape from their safe abodes. Your cat’s ID tag should include your name, address, and phone number. You may even consider microchipping your pet, which would make finding it an easy process if it happens to run away. And when picking a collar, we recommend a breakaway model that easily unhooks, to prevent your cat from being strangled if it gets stuck on a piece of furniture or on a tree branch. The number of cats you have will determine the number of litter boxes you will need. A general rule of thumb is at least one litter box per cat. And if you have a multi-level house, you will want boxes on each floor of the house. Additionally, cats have extremely strong olfactory senses and will refuse to use a box that stinks. This means, if you don’t want your cat relieving itself in a corner of your home somewhere, you’ll need to regularly scoop out its box. Cats are private, so select a private and quiet location where they can do their business. Scratching is a normal and even essential part of being a cat. While it’s understandable that you might try to train your cat not to scratch anything in your house (because no one loves destroyed furniture), the better option is to provide them with a scratching post. Scratching allows for the outer, dead part of a cat’s nail to be removed and exposes the new growth underneath, so it’s a healthy activity for every feline. If your ball of fluff is still preferring to scratch the curtains and furniture after you give them the post as an option, try placing a few drops of Feliscratch on the post. Another option to consider is laser-declaw for your cat. Contact us at Anasazi Animal Clinic to find out more about this safe procedure. 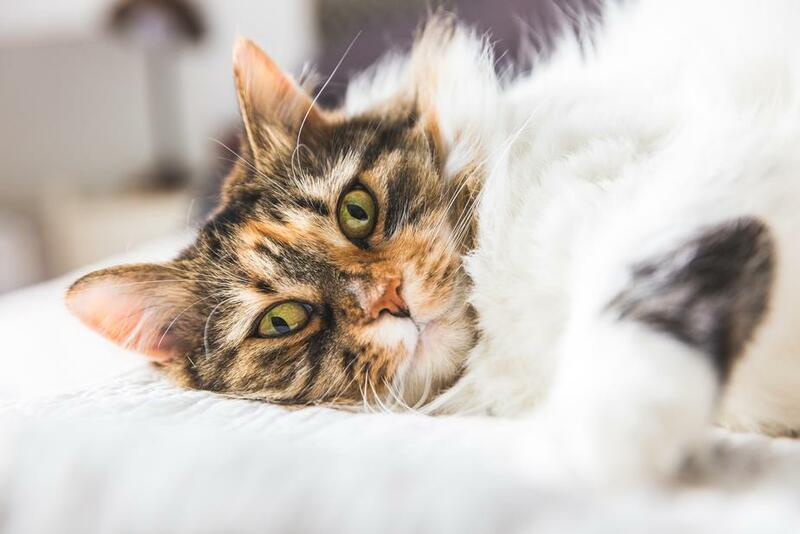 Cats are an ideal option for the pet owner who wants a low-maintenance fluffy feline, but remember, they are particular about their environment and will require specific care. Anasazi Animal Clinic is your local veterinarian clinic in Gilbert, and we’d be happy to answer any additional questions about general cat care.